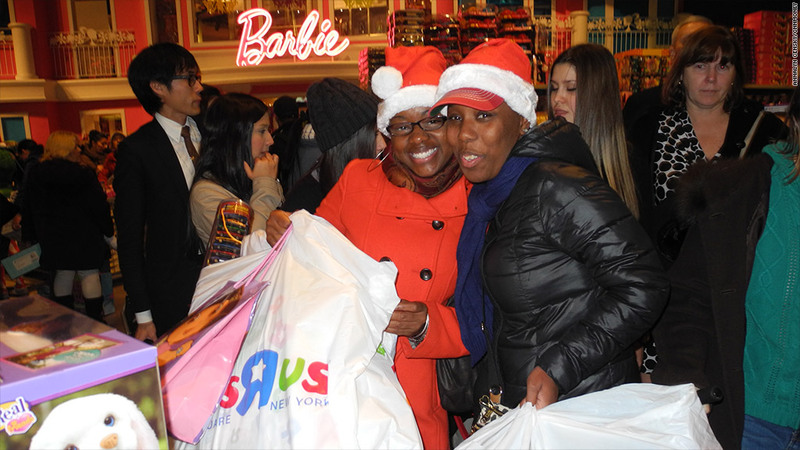 Lots of holiday shoppers hit the stores, such as Toys R Us in New York's Times Square, on Thanksgiving night. There were more shoppers in the nation's malls and big-box stores on Black Friday than there were last year, according to a report issued Saturday. But retailers still aren't sure that starting the holiday shopping season on Thanksgiving night proved successful. "While foot traffic did increase on Friday, those Thursday deals attracted some of the spending that's usually meant for Friday," said Bill Martin, ShopperTrak's founder, in a statement. "Black Friday shopping continues to expand into Thanksgiving Day and will impact the way we look at all of the 'Black' weekend results, since more shopping hours allows for more shopping visits and a smoothing of sales across all of the days," said Martin. Shoppers took advantage of early Thanksgiving night openings by retailers such as Wal-Mart (WMT), Target (TGT), Sears (SHLD) and Toys R Us. Shoppers started lining up at the Sears at North Point Mall in Alpharetta, Ga., around 6:30 p.m. on Thursday, and by the time the retailer opened, there was a crowd of about 500 people, said Nick Nicolosi, the mall's general manager. When the clock struck midnight and other stores opened, Nicolosi estimated that about 5,000 people were waiting to storm the stores -- the biggest Black Friday crowd North Point has seen since it began hosting its Rockin Shoppin Eve event five years ago. A long list of online retailers -- including Wal-Mart, Amazon (AMZN), Best Buy (BBY) and The Disney Store -- unveiled "pre-Black Friday deals" even before Thanksgiving. "We've absolutely seen this whole weekend turn into one big promotional event," said Jay Henderson, strategy director for IBM Smarter Commerce. "Black Friday deals are no longer just for the [brick-and-mortar] store, and Cyber Monday deals are no longer just for Monday." However, the initial surge is likely to be temporary. 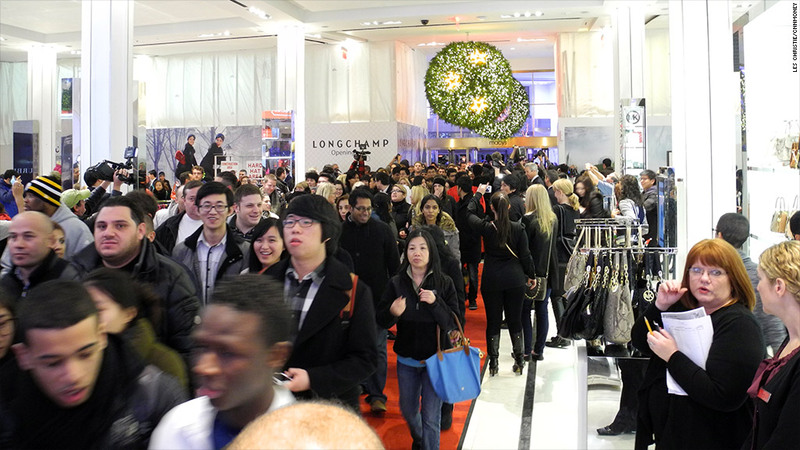 By Sunday morning, Cohen expects shopper traffic to fall back to normal pre-holiday sales levels. "There are more hours to shop, but consumers don't have more relatives or more money in their pocket, so once all the dust settles, we won't see too much growth overall," he said. Julianne Pepitone and Hibah Yousuf contributed to this article.